← Want direct front line input into health planning? How about whistleblower protection? We’ve been trying to assess in recent weeks how many of the 100 long-term care inspectors Health Minister Deb Matthews promised in June 2013 have actually been hired. The official word is now in: 89 – all of them temporary or “fixed term” contracts. January 13 we pointed out that the promise of having every nursing home receive a resident quality inspection in 2014 and annually thereafter will be difficult to fulfill if all these inspectors are intended to be on the job for only 12 months. It normally takes three inspectors – nursing, dietary and environmental — as long as two weeks to complete the full RQI inspection. This is on top of responding to more than 2,000 complaints each year from families and residents. We’ve heard back from two more Local Health Integration Networks on their policy around making public board documents. The Welland Tribune tripped our interest in this policy after they suggested the Hamilton Niagara Haldimand Brant LHIN was the least transparent in the province, posting board materials as long as six weeks after the actual board meeting. Our January 7 post noted that four LHINs were missing from the newspaper’s survey and we decided to send them e-mails that afternoon asking about their disclosure policy. This is important given it can be difficult to follow the discussion at a LHIN board meeting without access to the documents (ie. briefing notes, minutes, reports) board members are referencing. It raises the question how “open” is an open board meeting? Most of the LHINs post their documents well in advance of board meetings or at least make documents available during the meeting. The first to get back to us of the four LHINs missing from the Tribune survey was Toronto Central, but more recently Central West and Mississauga Halton checked in, both indicating that they too offered more than an agenda to citizens attending their board proceedings. Central West, responding to our question on January 21, posts all board material seven days prior to their meeting. They also typically post meeting notices 25-30 days in advance. Central West deals with disclosure by noting all materials are in draft form until approved by their board. Mississauga Halton is not as open. It makes available board materials to the public at the actual meetings. Those not attending the meeting can request materials after the board meeting is complete. Minutes are made available online up to 30 days after the board has approved them. They post their yearly meeting schedule on-line at the beginning of the year and notify of any changes within the 10-days required under the Local Health System Integration Act. Mississauga Halton apologized for the 10 days it took to answer our question. Their response came January 17. That leaves just the North West LHIN to reply to our January 7 survey. September 23 we noted delegates to the Ontario PC Convention barely endorsed Tim Hudak’s plan to introduce legislation that would undermine the ability of the province’s unions to negotiate good contracts. Hudak essentially wants to scrap the Rand Formula that has served the province well since 1946. Evidently Hudak believes that all workers who benefit from a workplace collective agreement shouldn’t have to contribute to the cost of negotiating that agreement. You might call it the “something for nothing” platform. At the time we noted that former Ontario PC leader John Tory advised the party should get rid of the policy, concerned it would inflame an unnecessary war with labour at a time when all Ontarians should be pulling together on the economy. While Hudak didn’t include this policy in his recent “one million jobs” (cue Austen Power nemesis Dr. Evil) platform, particularly as a by-election is presently taking place in labour-friendly Niagara, he did fire a Windsor-area PC candidate for openly opposing this U.S.-style initiative. According to the Toronto Star, Essex PC candidate Dave Brister was asked to recant his opposition to the misnamed “right to work” legislation in exchange for retaining his candidacy. Brister refused and was subsequently dumped by Hudak. 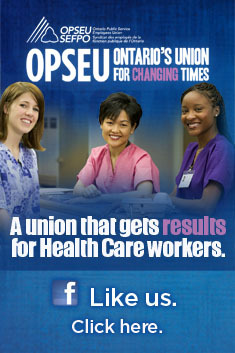 To watch OPSEU’s documentary on the impact of such legislation on U.S. workers, click here. For the Canadian Centre for Policy Alternatives take on Hudak’s fantasy jobs plan, click here. This entry was posted in Uncategorized and tagged Central West LHIN, John Tory, Long term care inspectors, Mississauga Halton LHIN, North West LHIN, right to work legislation in Ontario, Tim Hudak. Bookmark the permalink.